Our Open Air Fitness bootcamp is for all fitness levels and encompasses everything that is great about a bootcamp. Team spirit, hard work but fun to be involved in. Our bootcamp’s mixture of both cardiovascular and resistance training, with a blend of body weight and free weight workouts adds to the variation of the session, as we aim to never repeat a session! We have a offer for 8 sessions for £35. These 8 classes will have a year expiry on them and can be used in either of the Tuesday evening or Saturday morning classes. Go for the unlimited monthly offer, at £32 a month you can attend as many of the Tuesday evening and Saturday morning classes as you would like. 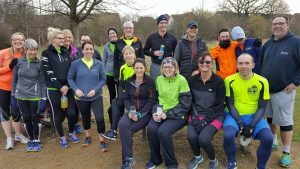 We all need a little something to aim for, which is why we set up the Open Air Fitness Bootcamp or OAF top scheme to give some extra purpose. 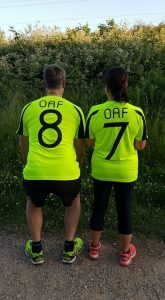 Only on a Saturday class can you perform some laps around our 400m track, those laps could be walked, jogged or ran and after 625 laps which is 250,000 meters or 155 miles, we will give you your very own OAF top (pictured left). We have found it to be a really positive incentive and has helped 19 bootcamper’s hit their OAF status,which is just brilliant. Also since the start of the lap counter back in November 2014, several bootcamper’s have managed to hit their double OAF status and almost onto their third. With the incentive we have really found it to improve peoples running styles as they wish to achieve more distance during the class aswell as improved pace.